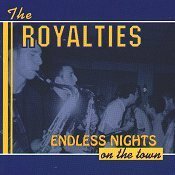 Hailing from New Jersey, The Royalties are an eight-piece traditional ska band. On their debut CD, ENDLESS NIGHTS, they serve up twelve songs that have enough pull to get to you to dance and have fun. Starting off with an instrumental to warm you up, "Frankenstein Ska" doesn't win any points for song title, but does possess a nice horn section. Their three-piece horn section (tenor sax, alto sax, and trombone) is able to stretch their sounds and take control of the song. Shooting through you with a warm sensation, they're the ones that will get you moving as you start to think about dancing. Going along with their anti-racist, anti-homophobic, equal rights for all beliefs (subsequently, there is a list of organizations they believe in and support in the booklet), "The Dream" professes their dissatisfaction with people who are 'blind' and can't see that everyone is equal. A nice, steady dance beat keeps the song in tact, while the lyrics become the center focus. When vocals are present, the song takes on a much more relaxed, gentle flow to allow the anti-hate sentiment to really be absorbed. But, when no vocals are present the song takes on a sharper feel. Led by the horns, the song suddenly becomes a bit more twisted, with a slightly heavier feel. Not really fitting in, this is the only part of the song that doesn't seem fluent. The rest of the song flows smoothly, and will instantly impact you. Keeping with the steady pace of the disc, "Oh Please" offers up another calm, traditional number that will get you dancing and moving with a gentle sway. Very relaxing and breezy, you'll sit back and fully intake their music with a smile on your face, or get up and softly move with the music. "Avoid The Crime" breaks the usually calm tone of the album and offers up a slightly harsher traditional number. The drums help put a little edge to the song, while the horns follow through with some emphasizing notes that also help put an uneasy feeling in the music. Then there are the vocals, which jump from soft singing to fairly harsh yells, giving the song a startling boost here and there. The striking upbeat also maintains the tougher feel of the music -- but don't think the song is turning into anything other than a rather heavy traditional number. Finishing off with a bouncy, piano-driven number by the name of "Heart and Soul," the band covers portions of the classic "chopsticks," while integrating their own ska material. Flat out a fun song to listen too, it serves as a nice close to this disc. This young band has a lot of promise, but also a ways to go. Their sound is nicely structured, and has a lot of good points but, the band as a whole, could be a bit tighter. Still a strong debut, future releases from this band should just get better and better. I'll give this disc a B.